Dr. Margie Downes is a dedicated chiropractor in Raynham, treating and educating patients just like you. I’m here to help and I can’t wait to meet you! When Dr. Downes was five years old, her father suffered from severe lower back pain. Later, he found that the low back pain was because of a herniated disc he didn’t realize he had. He was given pain medication and scheduled for a serious back operation. Knowing that surgery should be the last resort, he decided to get a second opinion and started receiving adjustments from a chiropractor. Chiropractic care changed my father s life! He never went for surgery, got rid of the pain pills, and learned a lot from his chiropractor on how to keep his spine healthy. I saw the marvel of chiropractic care and knew that I wanted to become a chiropractor. 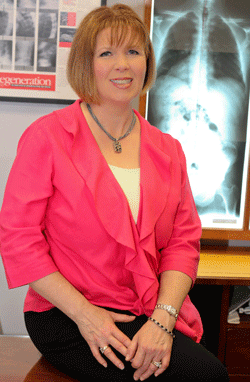 Dr. Downes eagerly received her chiropractic education from Palmer College of Chiropractic. What saddens me is how much chiropractic care is misunderstood. It’s so fascinating and I just wish everyone will soon see it’s beauty. So, my goal is to share the love and share the healing! Why Chiropractic Care? No Medication. No Surgery. Chiropractic care is all-natural, holistic care that helps you heal from within… allowing you to live a life of health and joy you may have only dreamed about. When you take care of your body, it can take care of you for the rest of your life. When she is not adjusting people, Dr. Downes loves to travel, especially in beautiful Chatham, Cape Cod. She loves to stay active whether it is by walking her dogs, taking her regular spinning classes or doing Pilates exercises. Always interested in healthy living, Dr. Downes is an avid cook and natural food student and advocate. We’re here to help your family in any way possible. So, contact us today and let’s get started!